Smoant Battlestar 200w TC Box Mod Review - Daily Vaping Deals & The Best Vape Product Reviews at Vaping Cheap! Smoant has been releasing quite a few new products lately, and while the Battlestar isn’t the newest, it is one of the more popular devices they offer. The Battlestar offers the user tons of features while sporting an compact and ergonomic design. Dual 18650 box mods are incredibly popular since they’re right in the middle when it comes to battery life, power and portability. With that being said, how does this dual 18650 device compare to the rest? We’ll see in this review! Before getting any further, we’d like to thank Heaven Gifts for sending this vape mod our way for the purposes of this review! 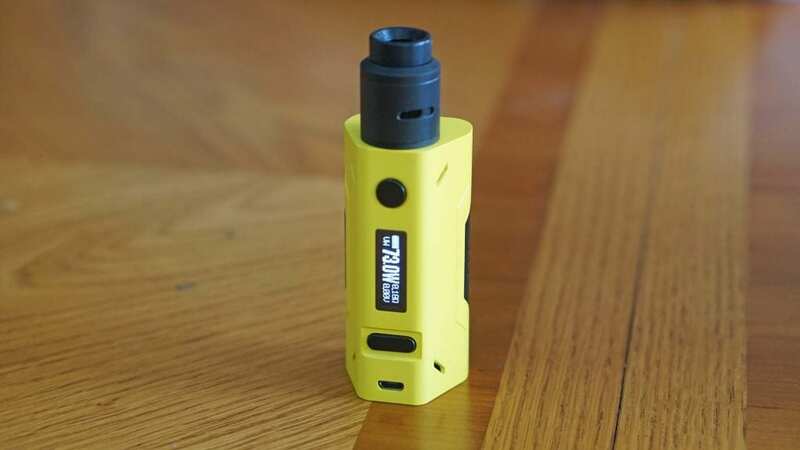 In the Smoant Battlestar review, we’ll cover first impressions, usage, performance, pros and cons, and conclude with whether or not we recommend it! Click Here to Check Out the Smoant Battlestar! 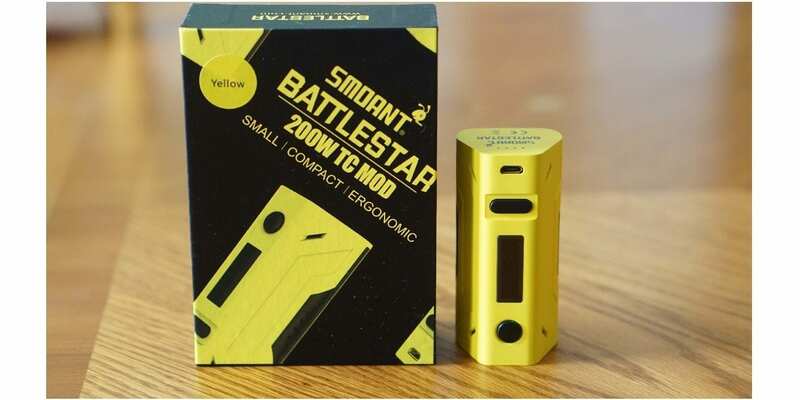 The packaging of the Smoant Battlestar 200w TC Box Mod is great, on the front it shows an image of the device itself alongside the name and on the back it has some minor information about the features offered with the Battlestar. This type of packaging is a bit different than what we’ve seen from other companies in the vape industry, and I do like the overall design of it. For presentation, it definitely gets a thumbs up. Once you slide open the box, you’re met with the Smoant Battlestar. It’s well protected, so you’ll have no worries with this box mod during transit. Included with this device you do receive a USB charging cable, user manual, QA card and a battery warning card. It’s a pro for sure that they included a battery warning card in the box. I think more companies should do this since some vapers may be quite new and not really understand battery safety. The color I received the the Black and Yellow. There are a ton of different colors options available for this box mod such as full black, rainbow, camo, golden, bronze blue, classic bronze, copper colored and much more. This is surely a pro as it’s always a good thing to have multiple color options when buying a new vape device. When first holding the device in my hands, I immediately thought it was comfortable to hold. I do like this design a lot as it’s not only comfortable in the hands, it’s compact which makes it great for traveling with. In addition, there’s a good amount of battery venting along the battery door and on the bottom. The construction of the Battlestar is great. It is primarily constructed of zinc alloy, so it’s not only durable, but pretty lightweight as well. The micro USB port is on the front of the device, which is another pro. I do hate it when companies put the USB port on the bottom, as this is just an inconvenience in my opinion. I do want to mention that I saw no where stating whether it is firmware upgradeable or not. I don’t think this device is firmware upgradeable, so I’ll list this one as a con for sure. The battery door is held on tightly with magnets. Even though this is the case, getting the battery door off is pretty easy. Simply hold the two sides of the battery door and you can pull it off with some effort. However, there is a little bit of play when moving it side to side, which may be a con to some. This wasn’t really a con to me. Overall, my first impressions of the Smoant Battlestar 200w TC Box Mod was great! This device is compact and lightweight, so I was excited to use it with me as my daily dual 18650 mod. As mentioned previously, the Smoant Battlestar has a compact, lightweight and ergonomic design. With that being said, it’s been a pleasure to use this device as my primary dual 18650 box mod. It fits great in the pocket, and I’m sure you’ll have no issues when putting this in a purse or book bag. This is definitely one of the more ergonomic devices I’ve come across in a while, and I’m sure we’ll see more devices with this type of design. All of the buttons on the Battlestar are nice and clickly. In addition, they do have great feedback when you press each button, which is great. The display screen is also pretty bright and easy to see both inside and outside of the house, even in sunlight. The display screen does show you the wattage, battery life (battery bar), applied voltage, resistance and which mode you’re currently in. Navigating through the menu system is incredibly easy as well with the Battlestar. Five click will turn the device on and off. Three clicks will enter the menu, and you can scroll through the options using the wattage up and down buttons. The modes include temperature control for Ni200, Ti, SS, NC, TCR and VW mode. You can adjust the wattage in temperature control mode by pressing the wattage up and firing button. In addition, you can fire this device all the way up to 200w in TC mode, which is a huge pro in my opinion. If you press all of the buttons (fire button, wattage up and down buttons) you will lock the device. However, you are only locking the wattage or temperature adjustments, you can still fire the device. In wattage mode, if you press the fire and wattage up buttons you will invert the screen color. Also, something worth mentioning is that every time you screw on a new atomizer it will ask you if it’s a new coil or same coil, simply use the wattage up or down button and press the fire button to select the desired option. Atomizers up to 25mm in diameter will sit flush with no overhang, which is definitely a pro. In addition, all of the atomizers I’ve attached to this device worked with no issues whatsoever, even RDAs with longer 510 pins. Overall, using this device has been great. It’s pocket friendly and very easy to use, so no matter if you’re a beginner or advanced user, you’ll have no issues when it comes to using the Smoant Battlestar. 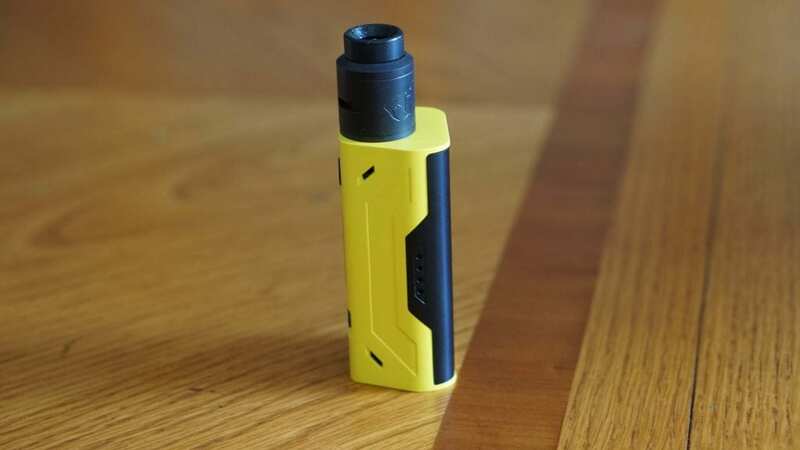 As mentioned earlier in this review, the Smoant Battlestar does require 2 high drain 18650 batteries, and has a maximum wattage output of 200w. 200w is more than enough to power pretty much any coil build you throw at this box mod. Now, I don’t have the necessary equipment to really test if this device can actually hit a full 200w, but I can certainly say it feels like it delivers the power you set it at. I did vape this device at 170w, and it felt like it delivered this amount of power. Do keep in mind if you are vaping at this high of a wattage to use an 18650 battery with a higher CDR. I typically vape between 50w and 100w, and the performance there was stellar. There is zero delay when hitting the fire button, which is a huge pro. I was actually impressed by how responsive the fire button is with this device. The battery life is pretty good as well, and it’s pretty much the same as you would get with any other dual 18650 device. If you do vape at higher wattages, expect the battery life to suffer a bit. However, when vaping at lower wattages such as 50w, I can easily get through an entire work day without needing to change the batteries. The temperature control of this device is solid as well. I only tested this device in Stainless Steel temperature control as I rarely ever vape Ni200 or Ti wire. 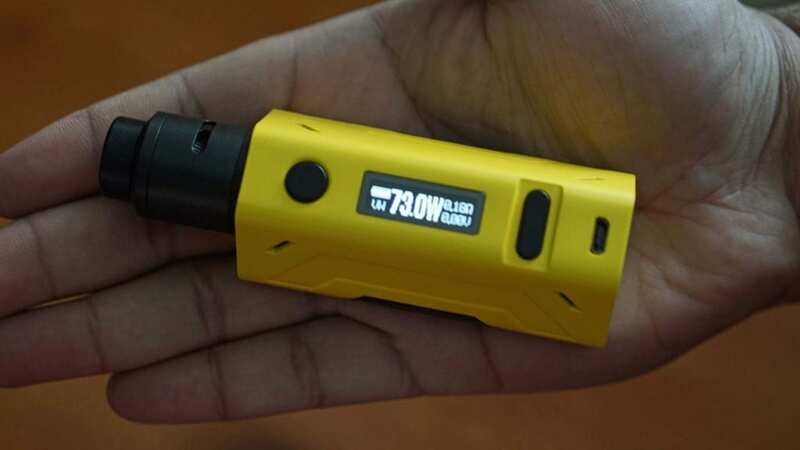 I wouldn’t say this device is as great in regards to performance in TC mode as a DNA device, but it’s definitely up there with some of the other box mods from Joyetech, Wismec, and Smok and others. I did use this box mod primarily in wattage mode though as I do prefer standard wattage mode most of the time when vaping. Something worth mentioning is that the resistance is not as accurate as say a DNA or YiHi device either, but it’s not off by much to be honest. For example, a coil build that normally reads as a 0.19 resistance will read slightly lower at 0.18 ohm. It’s not that big of a deal for me personally, but it’s something worth mentioning regardless. All in all, the performance of the Smoant Battlestar Box Mod was excellent! I had no major complaints when it came to the performance of this device. In conclusion, the Smoant Battlestar TC Box Mod has easily made its way to one of my favorite dual 18650 devices and it’ll stay in rotation for some time. This box mod is incredibly ergonomic, and pocket friendly. Not to mention, it’s easy to use and the display screen is nice and bright. Even though there were some cons to be mentioned, none of them would deter me from recommending this box mod. With how it performs, it really doesn’t need a firmware update in my opinion. I know for some vapers this may be a deal breaker, which is completely understandable. If you’re looking for a solid performing dual 18650 device with a lot of features that’s easy to use and is pretty compact, then the Smoant Battlestar 200w TC Box Mod is definitely something we highly recommend! We hope you find this review helpful in finding the right box mod to fit all of your vaping needs! Feel free to leave any questions or comments down below! Thanks for reading!